New designs for UK coins from 1p to from £1 were unveiled in April 2008 and started to appear in circulation during the summer of 2008. This represented the first full redesign of UK coinage in nearly 40 years. The coin designs are contemporary in nature while paying homage to the history of the United Kingdom. 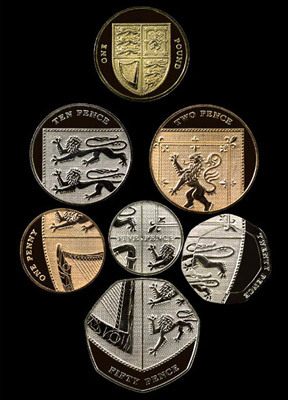 Each of the coins from 1p to 50p display a portion of the Shield of Royal Arms. The individual coins can be placed together to form the full shield. The £1 coin also displays the full shield. The current portrait of the Queen introduced in 1998 will remain on the other side of the coins. The coins were designed by 26 year old, graphic designer Matthew Dent. His designs were chosen as the winner of a competition launched by the Royal British Mint in August 2005 and closed on November 14, 2005. There were over 4,000 entries to the competition. Somewhat controversially, the new designs displace the iconic figure of Britannia, who had appeared on UK coins for more than 300 years. Shortly after the designs for the new coins were released, a senior adviser to the Royal Mint stated that Britannia would appear on the new design £2 coin which would be issued within the next two years.